Believed to have hosted one of the world's first health resorts (for our old mate Herod the Great), in addition to being a supplier of a wide variety of products, from asphalt for Egyptian mummification to potash for fertilisers, the Dead Sea is a place not only rich in names and minerals, but also in history. The sad thing is, that the future history of the Dead Sea is under serious threat as it is shrinking at an alarming rate. Diversion of the Jordan River, for drinking water and agriculture and displacement of huge amounts of water to extract phosphates for fertilizer and pesticides, is causing the level to plummet about five feet per year. Unless something is done to resolve the reasons for this potential ecological disaster, it may mean that the Dead Sea disappears for good. This will mean that the mineral rich mud and waters, touted as relieving a wide range of ailments, including psoriasis, eczema and osteoarthritis, in addition to making your skin look ten years younger, will no longer be available for anyone to enjoy. 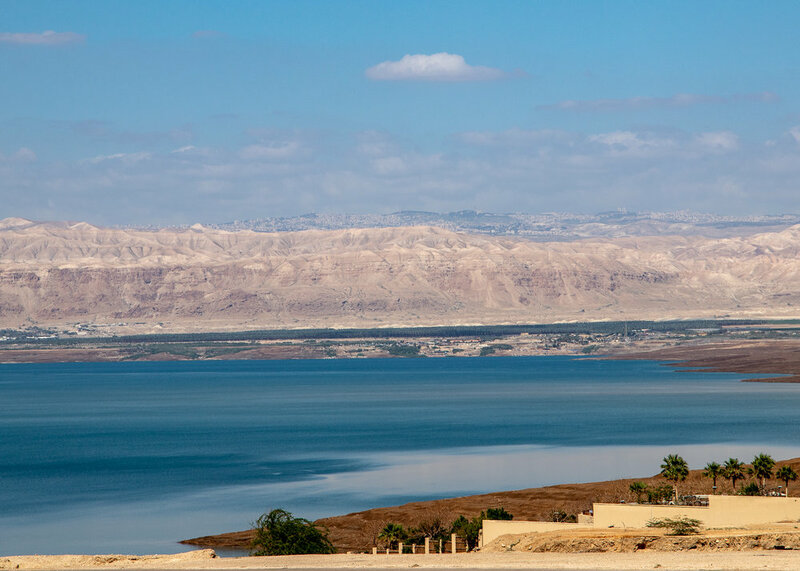 Situated at the lowest point on earth, with its surface being 429 metres below sea level, the Dead Sea’s waters are nearly 10 times saltier than the world's oceans. All this salinity, of course, comes with even more non-health related benefits. Namely, the ability to float effortlessly in its waters. All this fun, however, usually comes at a substantial price. Private beach access means either pricy accommodation (outside our budget) or payment of exorbitant day passes ranging from 35 JD to 60 JD per person. Even the cheapest, publicly available beach in Jordan (the Amman Tourist Beach) charges 20 JD per person ($44 pp!). Whilst this is something which we’d pay given no other choice, we managed to track down a much cheaper option at Hassan’s Beach. Located just before Porto Dead Sea, a steep dirt track takes you to water’s edge where some shabby looking “cabanas” are situated, along with cheap outdoor furniture to sit on. On arrival a guy approached us and tried to rent these out to us for something like 20 JD (for all of us), but we politely declined and simply put our stuff down on the sandy shore and entered the water for our own relaxing dip. Now, the beach and facilities aren’t exactly anything to write home about (unless you’re writing a blog for cheapskates of course! ), but the bottom line is that the whole floating in the Dead Sea experience cost us nothing. We would’ve taken a shower (5 JD for all of us), but the guy had disappeared, so instead we simply towelled ourselves off, jumped in the car and drove back to our accommodation. Some tips for anyone thinking of having a dip in the Dead Sea. Firstly, the high salt content will mean any cuts or abrasions will seriously sting. Make sure you haven’t shaved recently (face or anywhere else). If you do have some cuts, liberally apply Vasoline like we did as this works a treat. Secondly, make sure you wear jandals as the “sea” floor can be seriously rocky. Thirdly, if you’ve got kids make sure they wear goggles. Kids tend to splash about no matter what you tell them and giving yourself an impromptu salt water eye bath is no fun for anyone. The best way to avoid splashing yourself is to enter in backwards (i.e. walk in, squat down into the water and lie back). Lastly, the water is really oily. Showering afterwards really is a good idea. Having done what we wanted to do in the Dead Sea area, we were starting to get seriously amped for the expected highlight of our trip - a visit to Petra in Wadi Musa. But first, we had some crusader castle viewing to do.